Hasbro To Launch A Make-Your-Own Line Of Lightsabers | OhGizmo! By David Ponce on 02/18/15 • Leave a comment! It’s pretty clear there’s a new Star Wars movie in the works because the merchandising machine is starting to run full steam. Hasbro has announced a cool line of lightsaber toys that can be customized in many ways, allowing children young and old alike to create lightsabers that are as weird as they’d be potentially lethal to the person who wields them. The main Jedi Master Lightsaber set (for ages 4 and up, $49.99 includes a lightsaber with lights and electronic sounds, a pair of lightdaggers, an expansion hilt and a variety of connectors. 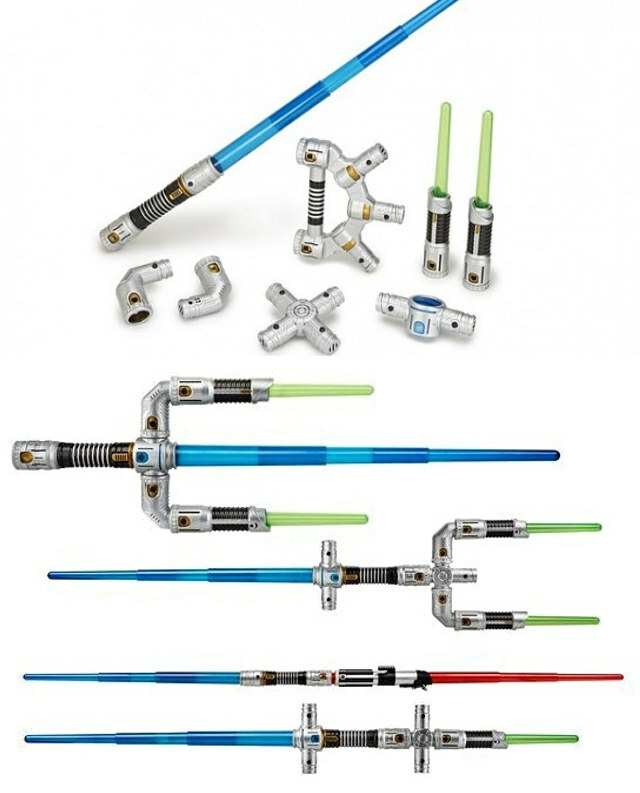 From there, kids can mIx and match from three other assortments with connectors and lightsaber blades tied to various characters. The electronic lightsaber ($19.99) comes in Obi-Wan Kenobi, Darth Vader and Luke Skywalker flavors, the foam lightsaber ($14.99) has Yoda, Vader and Luke variants, and the extend lightsaber ($9.99) offers something for Luke, Vader and Anakin Skywalker fans. The line was on display at New York’s Toy Fair last week and will be launching this fall, in time for the release of the new movie in December.